The turning tide: Workers at Infosys Technologies offices in Brno, Czech Republic. More than a dozen languages are spoken at this facility. Mysore: From across India, thousands of recruits report to the Infosys Technologies Ltd’s campus here in India’s deep south. Amid the manicured lawns and modern buildings, they learn the finer points of software programming. Now India is outsourcing outsourcing. One of the constants of the global economy has been companies moving tasks—and jobs—to India, where they could be done at lower cost. But rising wages for programmers here, a strengthening currency and companies’ need for workers in their clients’ time zones or for workers who speak languages other than English, are challenging that model. At the same time, India is facing increased competition from countries seeking to emulate its success as a back office for wealthier neighbours: China for Japan, Morocco for France and Mexico for the US, for instance. Looking to beat back these new rivals, leading Indian companies are opening back offices in those countries, outsourcing work to them before their current clients do. Many executives in India now concede that outsourcing, having rained most heavily on the country, will increasingly sprinkle tasks across the planet. The future of outsourcing, said Ashok Vemuri, an Infosys senior vice-president, is “to take the work from any part of the world and do it in any part of the world". In May, Infosys’ Indian rival, Tata Consultancy Services Ltd, announced a new back office in Guadalajara, Mexico; it already has 5,000 staffers in Brazil, Chile and Uruguay. Cognizant Technology Solutions, with most of its operations in India, has now opened back offices in Phoenix, Arizona, and in Shanghai. Wipro Ltd, another Indian company, has outsourcing offices in Canada, China, Portugal, Romania and Saudi Arabia, among other locations. Last month, Wipro said it was opening a software development centre in Atlanta that would hire 500 programmers in three years. In a poetic reflection of the new face of outsourcing, Wipro chairman Azim Premji told Wall Street analysts this year that he was considering hubs in Idaho and Virginia, in addition to Georgia, to take advantage of “states which are less developed", Premji said. Infosys is building an archipelago of back offices—in Mexico, the Czech Republic, Thailand and China, as well as in low-cost regions of the US. The company wants to become a global matchmaker: Any time a company wants work done somewhere else, even just down the street, Infosys hopes to get the call. It is a peculiar ambition for a company that symbolizes the flow of tasks from the West to India. Most of Infosys’ 75,000 employees are Indians in India, and they account for most of the company’s $3.1 billion (Rs14,257 crore then) sales in the year that ended 31 March, from clients such as Bank of America Corp. and Goldman Sachs Group Inc. “India continues to be the No. 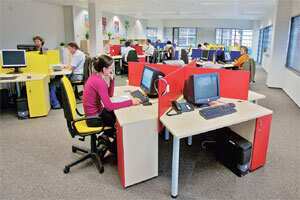 1 location for outsourcing," said S. Gopalakrishnan, the company’s chief executive officer, in a telephone interview. And yet, Infosys is quietly stringing together a necklace of global outsourcing hubs, where local workers work with little help from their Indian masters. The company opened an office in the Philippines in August and, a month earlier, bought back offices in Thailand and Poland from Royal Philips Electronics NV, a Dutch company. Infosys’ Indian outsourcing experience taught it to cut up a project, apportion each slice to the suitable worker, double-check quality and then export a final, reassembled product. The company believes it can clone its Indian back offices in unfamiliar nations and groom Chinese and Mexicans and Czechs to be more productive than local outsourcing companies could make them. “We have pioneered this movement of work," said Gopalakrishnan. “These new countries don’t have experience and maturity in doing that, and that’s what we’re taking to these countries." Some analysts compare the strategy to Japan’s penetration of auto-making in the US in the 1970s. Just as the Japanese learnt to make cars in America without Japanese workers, Indian vendors are learning to outsource without Indians, said Dennis McGuire, chairman of TPI, a consultancy based in Texas that focuses on outsourcing. For now, work that bypasses India remains a small part of Infosys’ business, but it is growing. The company can be highly secretive, but executives agreed to describe some of the new projects on the condition that clients not be named. In one project, an American bank needed to build a computer system to handle a new loan programme designed specifically for Hispanic customers. The system had to work in Spanish and, in making approval decisions, had to comprehend variables particular to the Hispanic market. Many Hispanics, for instance, remit money to families abroad, which affects their bank balances. The bank thought a Mexican team would have the right language skills and grasp of cultural nuances. But instead of going to a Mexican vendor or to an American vendor with Mexican operations, the bank retained three dozen engineers at Infosys, which had recently opened shop in Monterrey, Mexico. Such is the new outsourcing. A company in the US pays an Indian vendor 11,200km, away to supply it with Mexican workers situated 242km south of the US border. In Europe, too, companies now hire Infosys to manage back-office work in their backyards. In one example, a large American manufacturer with factories across Europe had to deal with bills from suppliers in multiple European countries. Each supplier billed the company in the suppliers’ home country, creating a complex lattice of payments to multiple suppliers, from multiple offices, in multiple currencies. Infosys manages the lattice. The manufacturer’s offices scan the invoices and send them to Infosys, where each is passed on to the right language team. The teams verify the orders and send the payment to the suppliers while logged in to the client’s computer system. More than a dozen languages are spoken at the office in Brno, Czech Republic. The American programme in Mysore is meant to keep open a pipeline of diverse workers for the company. Trainees had no software knowledge. By teaching novices, Infosys hopes to save money and attract workers who will turn down better-known companies for the chance to learn a new skill. “It’s the equivalent of a bachelor’s in computer science in six months," said a trainee, Melissa Adams, 22. Adams graduated last spring from the University of Washington with a business degree and turned down Google for Infosys. Still, even as outsourcing moves in new directions, old perceptions linger. When Jeff Rand, 23, another American trainee, told his grandmother, “I’m going to be moving to India and working as a software engineer for the next six months, she said, ‘Maybe I’ll get to talk to you when I have a problem with my credit card’." “It took me about two or three weeks to explain to my grandma that I was not going to be working in a call centre," Rand said with a rueful chuckle.